Home blessings home sweet home married life Our new home.. Our new Beginning..
Our new home.. Our new Beginning.. Finally, we’re home, we’re all alone! 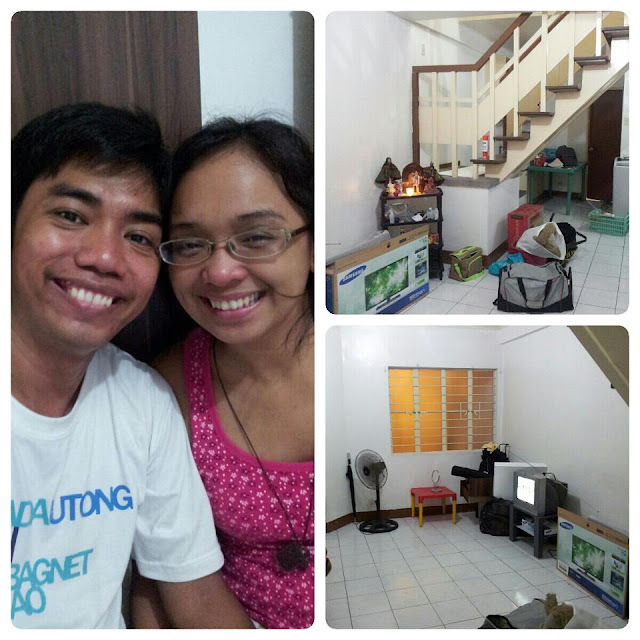 Yesterday, Ian and I left their house at Manila and move in Makati. We don’t own the house, we just rent it. Few months before our wedding, we started to scout for the house to temporary live in since we need to budget our savings for future. We came across the streets in Manila but ended nothing, so we decided to explore my city, Makati! We walked from one barangay to another, we call and texted numerous numbers to inquire, we do ocular visit and check the units for rent but nothing fits our taste. We have 2 simple criteria for our home; 2 BR and up and down, that’s it. Until I saw a banner posted in the meralco lights stand, we called the number and asked if we could visit the house for rent, fortunately they allow us to drop in on. As we arrived, they currently repairing some parts of the house, they painted the walls, they restore the cabinets plus defective lights removed and replaced. When we saw the house, we know this is it! For just 2 weeks, we informed our families that we are going to rent a house for us. This is the right time for us to be alone, to experience a married life all by ourselves. We need to practice how to live with each other, to run through the skills of budgeting, to know each other more and many more. So sorry for the poor picture, kakaiyak ko lang nyan because I’m so overwhelmed about my life now. All my dreams slowly came true, to be married, to be with my loving husband in sickness and in health, in richer or poorer. We are both excited to fulfill our listed dreams SOON!